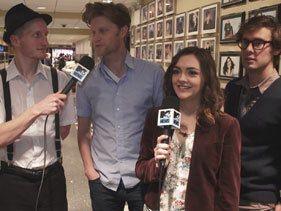 2013 is shaping up to be quite the year for American folk rock band The Lumineers. The group has been nominated for two Grammy Awards, had their song "Ho Hey" featured in the "Silver Linings Playbook" trailer and are gearing up to perform during this weekend's episode of "Saturday Night Live," alongside host Jennifer Lawrence. When MTV News caught up with The Lumineers during their rehearsal, the fivesome revealed that even though both parties are linked by "Silver Linings Playbook" (Lawrence won a Golden Globe for her role as Tiffany), the "SNL" stage served as their official introduction. "This was our first time meeting Jennifer Lawrence," the band's cellist Neyla Pekarek told MTV News. "She's really kind, and it was really exciting to have our song in 'Silver Linings Playbook.' It's a great film, and she does a great job in it." While Wesley Schultz plans on leaving the sketch comedy to JLaw — "No one would recognize us, so cameos wouldn't really work," said the group's bassist and lead vocalist — other members of the band say you should keep your eyes peeled for potential sightings Saturday evening. "As far as we know we're going to just be performing but some people in the group might find a way to weasel in a skit or two," explained drummer Jeremia Fraites. "Like a reverse cameo. Just found your way into the skit somehow."